If you’d been feeling sleepy towards the end of the first day of London Fashion Week yesterday, Ashley Williams’ show had enough energy to jolt you out of a coma. Inspired by her longterm love – the late, great River Phoenix – the designer’s SS17 show was staged in a replica of a teenage girl’s bedroom and saw a stellar cast take to the catwalk. Here’s your five-point guide to what went down at the show. The ephemera of tween bedrooms was scattered across the catwalk, a mixture of the trappings of girlhood (dolls, lollypops, the colour pink) with items which winked towards more teenage years (empty vodka bottles, fag butts and KY Jelly). There was a bed, bookcase (complete with Madonna CDs) and even a bathroom sink, which one model positioned herself in front of for the duration of the show, gazing in a mirror as she chopped haphazardly at her own hair. Others sat around in teen-ennui mode, while another moved around the catwalk filming models as they walked out. “Adorbs floppy fringe, a vegetarian, a liberal, a true lost Hollywood figure, River Phoenix stared down at the young Ashley Williams from her bedroom wall.” So opened the show notes, casting the show as a tribute to the late heartthrob. One model sat on the runway stapling together River Phoenix zines, while another busied herself with photocopying pictures of him to make up the pages. 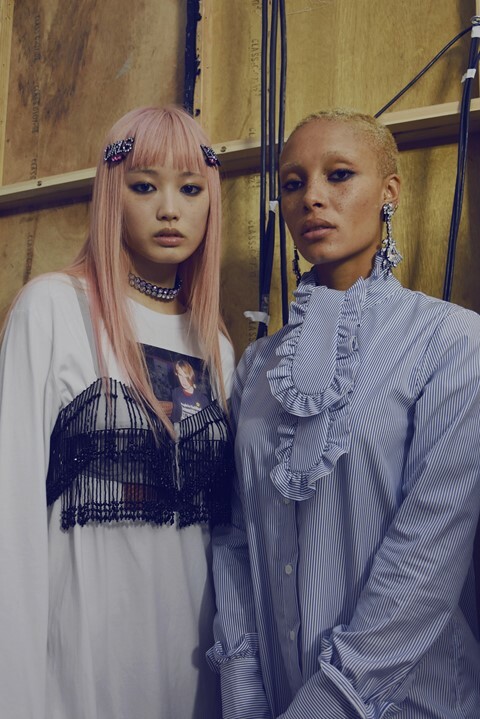 Familiar faces on the runway included pink-haired Louis Vuitton muse Fernanda Ly; fellow designer Claire Barrow (who walked at last season’s show), model and Gurls Talk founder Adwoa Aboah, who closed in a dress with puffball sleeves. The rest of the cast was made up of models and other Ashley Williams muses, such as her production manager Kathryn Hewitson and environmental activist Glacier Girl. The collection included the usual smattering of pop-y graphics courtesy of the legendary Fergus Purcell (who’s also behind the visuals for Palace and Aries, among others). For SS17, Purcell’s contribution came in the form of cupid motifs and slogans such as “Haircut” (perhaps in reference to Phoenix’s golden locks) and “First Born” (he was the oldest of five siblings). There was also a t-shirt emblazoned with a photograph of the late Hollywood star, and another bearing the lyrics to a song he wrote called “Betraying Mother”. Fun always takes prededence in Williams’ collections and this season was no exception. As well as Purcell’s graphics and the pop cultural tie-in, the collection contained 80s-style party dresses with leg-o-mutton sleeves, diamanté detailing and cutesy crystal accessories, boxy tailoring and slouchey pajama two-pieces. The show also saw the return of her stuffed animal bags – this season in the form of a white cat and purple bunny rabbit. With plenty of easy-to-wear jeans, jackets and jumpers too, Williams’ designs are as accessible as they are fun.